So have you seen the little solid and striped tees Target has right now for $5? I bought a bunch and have been having a blast dressing them up, mostly with a stack of mine and Nick's old tees. Mucho-score-age. 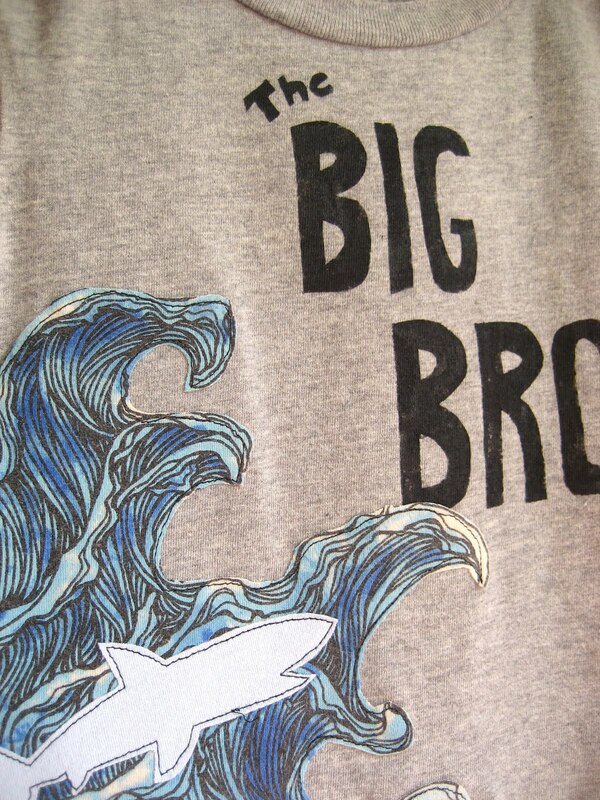 First up is the obligatory "big brother" shirt. 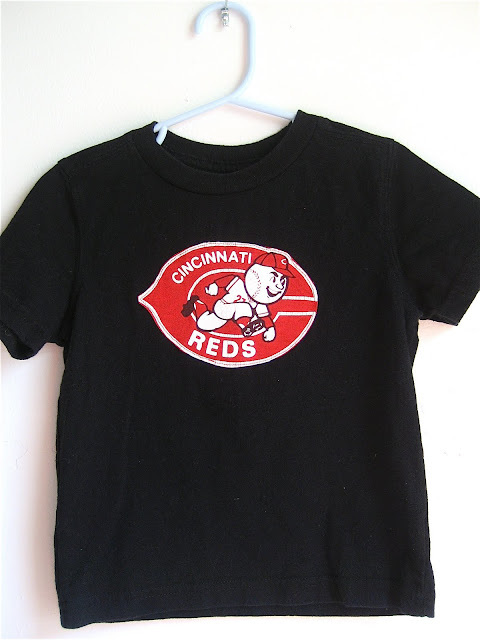 We parents sure love to put things on our kid's clothes that they won't understand. And me, I like to abbreviate things to make them even harder to understand. I even thought about making it say "bro-ham" or "brosef" like Jack Black calls Will Ferrell in his little Anchorman cameo. But that would have just confused most everyone and made our parents and grandparents question our moral bearings and worldviews...Hendrix is just going to like it because it has "shark attacks" on it. The words are freezer paper stenciled, and the wave part is a graphic that I just painted real quick. Just lying, it was already on another shirt. Then I slapped on a couple sharks. 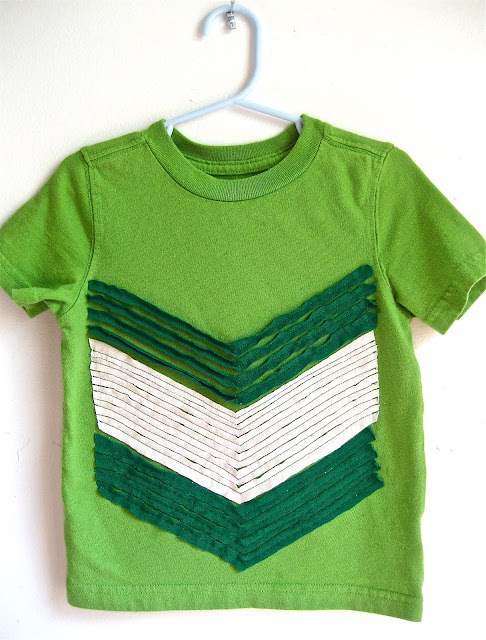 But only the top green chevron part is curling up to achieve the desired effect. After some quick pondering, I figured out that this is because I should have sewn the other two chevron panels opposite side down. Knit t-shirt material always has a side that curls up on the edges you cut into... D-oh. Maybe it will still curl up the more times I wash it, who knows. It's still his favorite color and cute enough to play outside in. I'm just glad the poor kid got something made for him in the midst of all these dresses and pink things. Just two more days until we meet Elsie Morgan! Squeeeeee!!!! These are UH-mazing. I am always thinking what I can make for the little man. Great idea! All of them look so good! why do our husbands always have to burst our bubbles???? Very cute. I was thinking the chevron shirt looked too tricky to be true, I'm glad I saw yours before I attempted (it still looks great) :) I found them on sale a couple weeks ago for $3, I kept going back to the store to get more! Now I'm getting ready to spruce up my little man's summer wardrobe and these are some good ideas! They all look fantastic! How cool!! I like the chevron one! when is baby girl scheduled to arrive?? 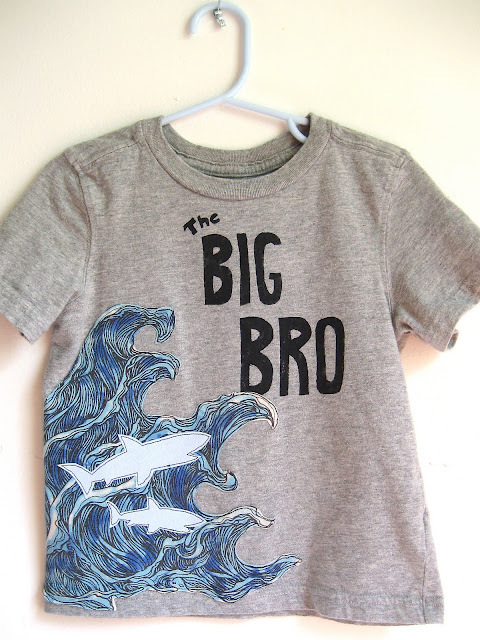 Your Big Bro shirt is very cute. I should have hired you :-) Good job Mama. I LOVE the big bro shirt! I kind of want to make one now!!! Oh hey, I had this baby.